SANDSTONE, Minn. - Art takes many forms, not least those fashioned by hands, as clay is turned by a potter, or oils put to brush and canvas by a painter. Jerry Kolter is that kind of artist, and more. In his hands are nurtured dogs of a special kind; those that can run like the wind, carrying their heads high, processing one scent from another and dismissing most before detecting the target aroma, that of a ruffed grouse. At which time these pointing dogs lock up board stiff. King of the forest. Queen, too. In the entire world there flies no bird more delectable - nor, when undertaken properly, more challenging to find and fell, to bring to hand, than the ruffed grouse. "Hunting grouse is very different from hunting other birds, such as pheasants," Kolter was saying the other day, on the eve of Minnesota's 2008 ruffed grouse season, which opened Saturday. "Grouse take a special kind of dog." Kolter, a former software developer, and his wife, Betsy, a horticulturist, are refugees from the Twin Cities and owners of Northwoods Bird Dogs (www.north-woodsbirddogs.com), located near this east-central Minnesota town. Surrounding the kennel is deer country, bear and wolf, too, but perhaps especially a land hospitable to grouse and woodcock. These last often are found in forests of mixed deciduous trees, aspen particularly, much of it interspersed with meadows and clear cuts, high-bush cranberries, and alder thickets in the lowlands. In Kolter's case, the dog-trainer-as-artisan analogy is no stretch. With his tutelage, promising puppies born from reputable parents and grandparents are continually encouraged and occasionally coaxed toward futures that place them among the planet's best grouse finders. No easy task, this, considering that a trainer of ruffed grouse dogs must be as knowledgeable about the quarry as he is the dogs in his charge. Grouse often anticipate approaching hunters and their dogs and seek escape on foot, rather than flying. Indeed, some ruffed grouse seem almost diabolical in their abilities to confuse pursuing dogs by acting one way on a given day and another way the next. "A young dog needs to be put on a lot of birds to know how to handle them," Kolter said. "And not just liberated (planted) birds. But wild birds." A master falconer who once hunted with goshawks and other aerial predators before turning his attention full-time to grouse dogs, Kolter grew up in southern Minnesota near Henderson and flew his first red-tailed hawk at age 12. "When I was a kid, I couldn't have a dog, so the first thing I did when I went to college was buy a Brittany spaniel puppy," he said. That dog years later gave way to an English setter, and soon Kolter cast an eye toward field trials. Now, some 20 years after he first entered grouse dog competitions, and having won many of them, he still runs 10 or so trials a year, some in Minnesota, some as far away as Pennsylvania. Add to these travels an annual August training trip to North Dakota to run young dogs on wild sharp-tailed grouse, and another monthlong winter trip to Texas or Oklahoma, and the process of shaping English setters and pointers - some owned by far-flung customers - unfolds in alternating installments of yard training and field work. "When a puppy is 12 to 16 weeks of age, I put them on birds," he said. "I start with liberated birds but move fairly quickly to wild birds." Much is made of a pointing dog's "range," or the distance a dog works from its handler. Owners of flushing dogs such as Labrador retrievers and springer spaniels, for example, want their animals ranging no farther from them than shotgun range, or about 35 yards. Pointing dogs typically move out more expansively, and Kolter said he is less worried about an animal's distance from him than whether "he is working with me." "I want a dog to go to cover, where birds will be," he said. "The issue is finding a bird and holding the bird until the handler arrives, not necessarily how close a dog is working to his handler." 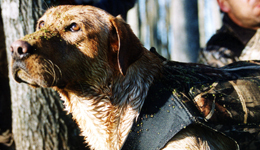 After young dogs are exposed to birds and assessed initially for drive, style and willingness to go to thick cover, Kolter returns to the fundamentals. "'Come,' 'Heel' and stopping on the 'Whoa' command are important parts of a young dog's training," he said. This includes electronic collar conditioning and teaching a dog to stand steadily on a 55-gallon barrel laid on its side. "The barrel helps the dog understand that when he is absolutely steady, the barrel doesn't move and he's rewarded by" a stroke of the handler's hand on his back and tail. Over time, the artwork that is a well-trained grouse dog begins to take shape. In tones both nuanced and vivid, these "paintings" ultimately bear the features of confident game finders. Perhaps on some days, pheasants will be sought - birds that present their own special challenges. But on most occasions, pheasants are child's play compared to grouse. And only experience afield can provide the finishing instruction necessary to fully shape a pointing dog into an animal that will find and hold this King of the Forest. "Grouse are tough," Kolter said. "It's not uncommon to see a good quail dog at 2 years of age. But rarely do you see a really good grouse dog before age 4."